A couple of weeks ago, my parents went to the Reading Terminal Market. I’ve never been there, but it’s on my bucket list, as I hear it is as close as you can get to heaven on earth for a foodie like me. They came back with all kinds of goodies for me, including the package I love above all other packages…white butcher paper, about 4 inches wide by 10 inches long, with the unmistakable aroma of thick-cut bacon wafting out of it. (Yes, I can smell the thickness of bacon through paper. I can.) So I did what any reasonable person would do…I made maple chocolate bacon skewers. 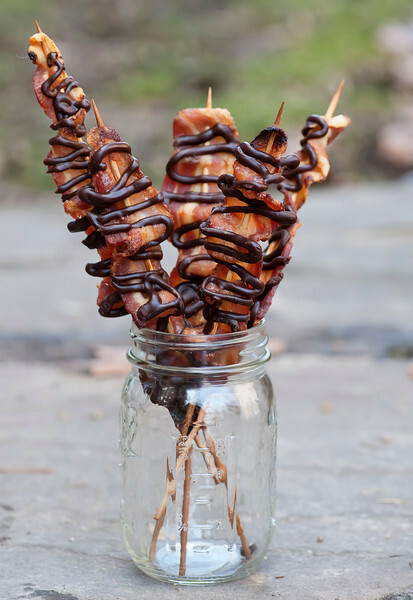 They are ridiculously and dangerously easy to make…you thread thick-cut bacon onto wooden skewers, in kind of a ribbon candy shape so you have lots of nice nooks and crannies for the chocolate. Line a rimmed baking sheet with foil, pop a metal cooling rack on it, and lay your skewers on the rack. Now paint both sides with maple syrup and bake them until they are nice and crisp. Let them cool to room temperature, and once they are cool, make a quick chocolate sauce by pouring a little lot cream over chopped chocolate and stirring it around. Now, you can either use a spoon to drizzle the sauce over the skewers, or you can spoon the sauce into a plastic zippered sandwich bag, snip off one corner and squeeze the sauce out of the corner, pastry bag style. That’s what I did, and I felt all professional. Now comes the hardest part, which is waiting for the chocolate to set. Pop the skewers in the fridge and they should be ready in about 30 minutes or so. These obviously make a very fun sweet and salty dessert, but if you have one before dinner with a glass of red wine…well, who really needs dinner after that? 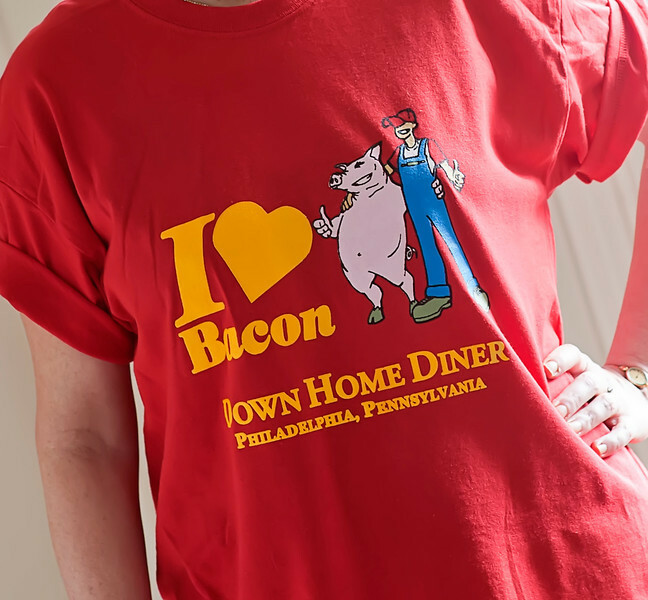 Last but definitely not least, my dad brought me home this shirt from the Reading Market as well…. I’m beginning to think I have a reputation or something! The two best tastes in the world! I can’t believe it took me this long to try it! Your parents obviously love you very much! :) Thick cut bacon would be one of my favorite gifts to receive as well. Your skewers look fabulous! I came here from Pinterest and I’ve got to say, this is spectacular. I am going to make these tomorrow with the Wright thick-cut applewood smoked bacon already in my freezer. I even have the SKEWERS and yes, maple syrup. I will have to send my bacon-loving husband to the store for the choccie but something tells me when he senses what’s afoot, it won’t be a problem. Now I am upset because some years ago I lived just outside Philadelphia and never heard of — much less visited — the Reading Terminal Market. We were in Philly again in May of 2011 and I wish we’d swung by there then. But it’s a mistake I won’t be making again if I ever find myself in the City of Brotherly Love. Oh and the teeshirt is pretty great. Thanks again for the recipe and happy baconing. O _ M _ G You have 3 of my favorite flavors here. I might try to kick it up a notch and infuse some bourbon in the chocolate then die and float of indulgence heaven! OMG right back! Let me know how it turns out!! Oh my! I made this delicious recipe for a party of bacon lovers. Doubled the recipe and it was ALL gone in 2 minutes!! Thank you so much for sharing. Will definitely be making this again. Oh, these look amazing. I had to feature them on BlogHer’s facebook page! When I originally commented I clicked the -Notify me when new comments are added- checkbox and now each time a comment is added I get four emails using the identical comment. Is there any way you could get rid of me from that service? Thanks! I am loving these for Fathers Day!! I am curious though, I want to make this tonight (2 night prior) and wonder if they’ll hold good crunch and flavor? Any thoughts here? Hi there! You can make them ahead, but with that long in the fridge they will be less crunchy and more chewy. They will still taste just fine, but if you are looking for more crunch, you are better off making them same day. Hope this helps and Happy Father’s Day!